The year was 2002. It was the year of the Euro, of being 20 pounds overweight, and of the great depression (my depression). The depression was caused by several factors: Family problems, studying something I disliked, no boyfriend, feeling lost. It was the year of overeating, self-loathing, hours of forced exercise, of some great experiences and lots of dark hours caught in despair. What do you call a midlife crisis when you are 22 - post teenage angst? Growing up? Whatever it was, it was the most difficult time of my life. I was searching for everything: The meaning of life, and what to do with mine; how people decided on careers, and what mine could be; where to live one day, and how. It was scary, but also exhilarating at times: My innate optimism allowed me to believe in the notion of "anything is possible". I loved nothing more than sitting around a camp fire, or a table at a pub, or in a quiet corner at a party, and fantasize about the future with friends. During those hours, we could be anything and anybody we wanted to be, and it was glorious. I was living in a dormitory at the time, not very far away from the airport. From my bed I had a clear view of the departing planes, and I watched them often, picturing myself being on board of one of them and flying off to an adventure. At that point of my life, I had never flown anywhere - you get to a lot of places by car in Europe. A couple of my friends had travelled extensively, and I talked to them often. The more they told me, the bigger my yearning grew - I needed to spread my wings and try to find a way out of this trap that my life had become. 2002 was also the year where I discovered the internet. Or, to be more precise, I became aware for the first time that there was a whole other world waiting inside computers - I had not yet grasped how big (or life changing) that world would turn out to be. First, I started with my school's intranet. There was a community board, an online black board of sorts, and as I was idly browsing through it, something caught my eye. "Who is interested in doing a practicum in Canada? We live in Canada's Wild West and are looking for students who would like to help out at the ranch. Many great outdoor activities available. For more information, contact [...]"
A surge of electricity went through me. Canada! Wild West! Ranch! My imagination went into overdrive: I pictured myself gathered around a big old table with the other farm hands in the mornings, devouring a hearty breakfast of bacon and eggs, and lots of coffee. How I would be shy to speak during the first few days due to my poor English, but how I would learn it quickly and joke around with them after a week. 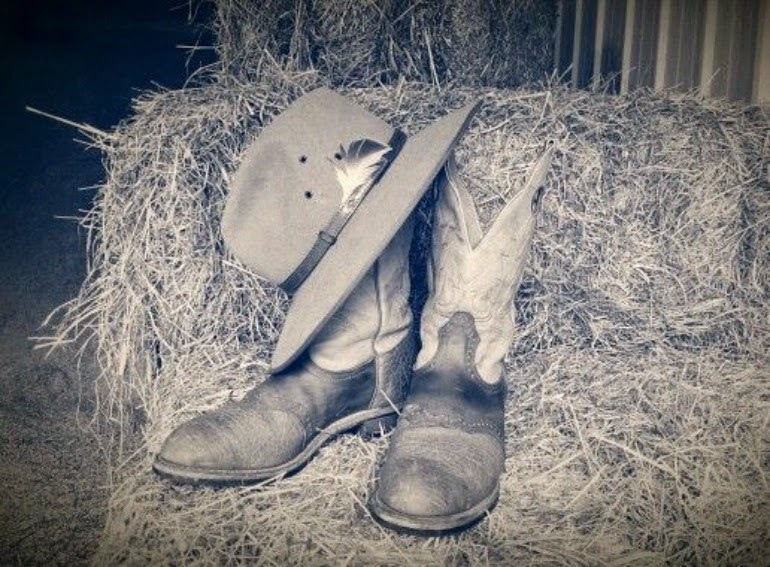 We would all work hard during the day, riding our horses (I didn't know how to ride, but I would learn it just as quickly as I learned English) and going on cattle drives; in the evenings, we would sit around camp fires, drinking beer and singing cowboy songs. I would have a summer romance - maybe even fall in love? Aah, those day dreams were delicious. I indulged in them for hours, elaborating them more with each passing day. I had also plucked up the courage to email the lady who had advertised - armed with a German-English dictionary, I wrote to her in English with a long list of questions. She emailed back, and it turned out that she was Dutch, but had lived in Germany for several years, less than an hour away from my home town! That was sign enough for me. I decided that now was the time to take action. On a rainy April afternoon, I hesitantly entered a travel agency, heart pounding, and told the travel agent that I wanted to book a ticket to Vancouver. I was incredibly nervous. Here I was, planning something huge (for me) all by myself! I hadn't told anybody about it, apart from a couple of close friends. Not only would that be the biggest purchase I had made thus far (in cash - I didn't have a credit card back then), but I was intimidated by my own courage: Did I really dare to travel halfway around the world, all by myself? Fly for the first time, go to a country where I didn't speak the language very well - all alone? Well, I had made up my mind. No matter how scary it was, I needed to do this. I was so unhappy at the time, I needed to get away - and Canada had always been the land of my dreams. So I bought my open-ended ticket for August 5, 2002 - not quite believing I was actually doing it as I handed the money over. Next step: Telling the family. Here is the thing you need to understand about my family: They are not exactly what you would call dare devils. More conservative, better-safe-than-sorry kinda people. So I did have an inkling that they wouldn't jump for joy when they heard about my plans. What I wasn't prepared for, however, was a stern family council waiting for me on a Friday evening as I got home from college. Here they all were: mom, dad, grandma, sister, brother-in-law, not a friendly face amongst them. The facial expressions ranged from disapproval (mom), concern (dad), disbelief (grandma), puzzlement (brother-in-law) to mild disinterest (sister). The arguments against my trip were manifold: Too dangerous, too expensive, I'm crazy, what has gotten into me - you get the idea. There were tears (I'm a crybaby) and lots of dispute, but in the end they had to accept it: I was going, against their wishes. After all, I was 22 years old, had paid for it with my own money, and was an adult (even though I rarely felt like one). In the end, they are always supportive: By the time August 5 rolled around, my parents had accepted my decision and both got up in the middle of the night to drive me the 3 hours to the airport. A couple of my friends had come to see me off as well, and I was more excited than scared. The adventure was about to begin! The next 18 hours were a blur of flight delays, an overanxious girl trying to share her meds with me (no thanks, stranger), missed connections and the arrival in Vancouver 8 hours later than expected, in the middle of the night, at an eerily deserted airport. Nobody was waiting for me. There I was, overtired and, once again, close to tears. My fellow passengers quickly disappeared, until there was barely anyone left - just me and a somewhat rowdy group of five or six guys sprawled on the floor, laughing and seemingly settling in for the night. What to do? I was so exhausted that I couldn't form a clear thought, so I walked aimlessly around the airport, trying to quell my rising panic. But don't forget kids, we were in Canada. The land of the polite, helpful people. One flight attendant took pity on me and approached me, asking kindly: "Do you need help? You look lost." I was so relieved, I almost burst into tears on the spot. With some difficulty I explained that the lady who was supposed to pick me up wasn't here, and I didn't know what to do. "Have you tried to call her?" she asked reasonably. Umm no, I hadn't. That would have been the most obvious next step, instead of circling the empty arrival area in the hope that she would magically appear. Anyway, we did get through to my hostess - let's call her Rose - and she explained that she had sent out a young German couple to pick me up, but that they had returned to their house for the night after waiting for me for hours. Rose called them, and an hour later I was finally rescued from the airport. As soon as we arrived at their house I fell into bed, thoroughly exhausted. My last thought before drifting off to sleep was: "I made it! I'm in Canada." I fell into a deep slumber with a smile on my face. Part one of - who knows how many? I'm going into detail here. I so wish I could do this!!! Just "up and relocate"...what an adventure! What a great story. I can't wait to hear the rest. I would love to pick up and travel somewhere. It takes courage to follow your dreams. I can relate to the 22 year old crisis. I'm 27 and feel like I'm finally a grown up. I am so excited to read more! Great first chapter - I'm excited to read more! It's so cathartic and satisfying to write it down, finally. I've been wanting to do that for such a long time! Part two is in the works! I can tell I'm really going to love this story because, well, I'm already loving it. You were/are so brave!